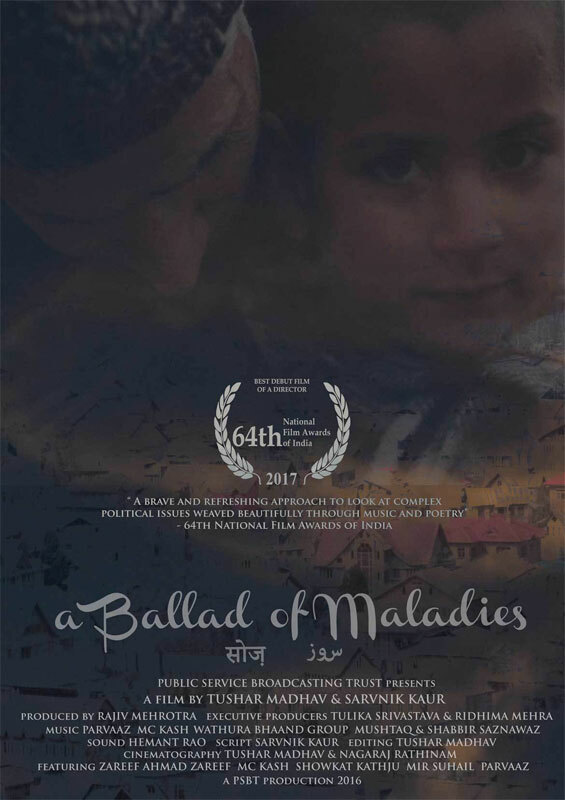 The York Centre for Asian Research and the Centre for South Asian Studies at the University of Toronto present a free screening of A BALLAD OF MALADIES on Thursday April 12th at 6PM. “Of folk, rock and hip-hop, the film is a portrait of different cultural practitioners whose work engages with the political upheavals and its social costs in contemporary Kashmir. The film is a glance into the collective memory of a people and the expressions of its history to understand the emerging voices of resistance and their resonance in the worldâ€™s most heavily militarized zone. In a journey through the metamorphoses of Kashmirâ€™s traditional art practices into its contemporary arts of resistance, the film unfolds a transformed cultural fabric of the valley, which departs from the notion of Kashmir as a â€˜paradiseâ€™. The event will begin with music and poetry recitation, followed by the screening (Urdu/Hindi with English Subtitles) at 6:30 pm and a talk back at 8:00 pm with directors Sarvnik Kaur and Tushar Madhav, and York University filmmaker Ali Kazimi. Tushar Madhav is interested in the geopolitics of contemporary and folk art and has independently shot and edited documentaries around the theme. He also conducts workshops on finding audio-visual alternatives for storytelling, documentation and media advocacy programmes with students, university professors and organizations that work with juvenile criminals and underprivileged girls. Sarvnik Kaur is a Mumbai based screenplay writer. Sheâ€™s been working in the Hindi film industry for the past five years. Her first novel Where Arrows Meet was published in 2012. She is an alma mater of the Mass Communication Research Centre, Jamia Millia Islmia University. This event is organized by Dr Reeju Ray and co-presented by the York Centre for Asian Research at York University, the Dr David Chu Program in Asia-Pacific Studies and the Centre for South Asian Studies at the University of Toronto, and the Kashmir Solidarity Group.